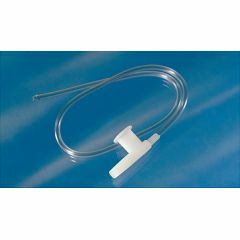 Our Tri-Flo® suction catheter design was created to be less traumatic to your patients while still providing high suctioning efficiency. Our infant and pediatric catheters (5/6, 8 or 10 Fr) feature depth markings to help facilitate proper catheter placement. Easy To Use. Effective. Good Value. Lightweight. Just like the ones used . in the hospital. My aunt of 86 years old was hospitalized Jan 10th with double pneumonia and was being suctioned up to 4 times a day due to the fluid build up in her lungs. She was sent home Feb 15, 2012 with antibiotitics, a prayer, and about a week to live. Using the Tri-Flo Single Suction Catheters to keep her lungs clear has been life saver and she is still here as of March 27, 2012 and her health is improving daily because of our ability to help to keep her lungs clear. The TriFlo ones we get from oxygen company (only 100 a month) do have markings on them which makes it easier for my brother to suction himself since he can't eye the catheter as it goes in. I have done it so often I can now gauge the depth but in the past I have gone beyond his trach and caused bleeding. Not sure why the 14r ones sold here don't have markings when all the other sizes do. I should have been more careful in my reading but needed more in a hurry. I was stuck.. Medicare only allows me 90 catheters a month. That sounds like a lot but I have a tracheostomy and had bronchitis so I went through them all. I was so happy to find you and the quick delivery was worth the extra cost. Lightweight. Good Value. Effective. Easy To Use. Thanks for the very prompt response to my order.